Nowhere in the title Batman: Assault on Arkham will you find the words "Suicide Squad", which is both an unfortunate misrepresentation of DC's latest animated film and, well, somewhat understandable since most of the general public likely hasn't heard of the universe's government-helmed initiative. In so many words, the group's existence taps into some of the wasted potential among DC's lesser-known villains -- from passing assassins to the henchmen and throwaway "copies" of more renowned antagonists -- offering them a chance to cut their incarceration time by executing dangerous missions as a team of classified, off-the-books operatives. 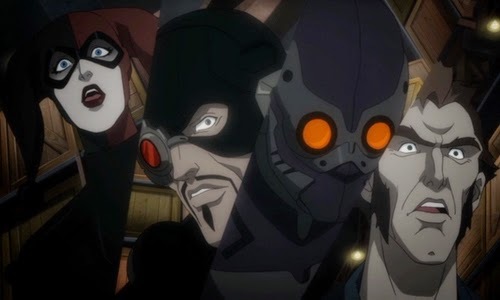 With the emerging popularity of the Arkham series of videogames (along with the recent TV iteration of Arrow), some of the Suicide Squad's notable recurring members have further increased in exposure, including the laser-sighted Deadshot and the Joker's bonkers ex-psychiatrist partner Harley Quinn. That makes it an opportune time for Warner Bros.' animation to get the band together for an outlandish hit on Gotham's iconic nuthouse, resulting in more brazen entertainment than one might expect of a Batman film that's only peripherally interested in Batman. While it's getting released as a lead-in of sorts to the next entry in Rocksteady's videogame series, Assault on Arkham actually takes place a few years before the events of Arkham Asylum (and a little while after Origins), making it a prequel with loose, flexible ties to the games' Batman mythology. Unsurprisingly, there isn't a whole lot more to the premise beyond what's covered in the title: after a black-ops attempt to apprehend The Riddler (Matthew Gray Gubler) goes sideways thanks to the Dark Knight's (Kevin Conroy) nobler intervention, bigwig government agent Amanda Waller (CCH Pounder) -- "The Wall" -- assembles a crew of imprisoned villains to covertly raid his new place of residence, Arkham Asylum, to recover a sensitive device that was in his possession. Veterans to Waller's "Task Force X" (both in-universe and on a meta level) including Deadshot (Neal McDonough), a Joker-less Harley Quinn (Hynden Walch), and Captain Boomerang (Greg Ellis) are brought together with newbies -- Black Spider (Giancarlo Esposito), Killer Frost (Jennifer Hale), King Shark (John DiMaggio), and KGBeast (Nolan North) -- for a calculated strike involving sleight of hand and usage of their individual strengths, all while evading Batman's grasp both off and on the grounds. Following Son of Batman's rickety, severe writing -- y'know, where Batman essentially gets date-raped and produces a murderous ten-year-old Marty Stu -- the straightforwardness of an antihero heist that isn't really focused on Batman at all, instead centered on some of his lesser-known rivals, sounds like an appealing distraction. While its own lapses in logic keep DC's latest direct-to-video animation from translating into a tighter overall story, from wonky lie detectors to flimsy security protocols at several levels of the asylum, Assault on Arkham soars past several of their recent offerings with its presentation of the villains and an unabashed, darkly-humorous attitude. Mostly, it's because the concept doesn't intrude on the characters' varied demeanors: there's plenty of breathing room for the loose-cannon leadership of Neal McDonough's excellent Deadshot and the supercharged quirk of Hynden Walch's jilted Harley Quinn, as well as Captain Boomerang's roguish gristle and the unlikely bond between King Shark (basically a cross between Bane and Croc) and the saucy Killer Frost. Allegiances fluctuate within the group amid the moving parts of Waller's plan(s), and the erratic rapport between their allowable one-note personas spices up the simplicity of casing Arkham. Starting from the dubstep-infused intro to the Suicide Squad's roster that resembles a modern caper flick, Assault on Arkham doesn't take itself too seriously -- or, rather, very seriously at all -- which could make it somewhat divisive with those yearning for harder-nosed storytelling. Working from a script by Justice League: War's Heath Corson, the pairing of directors Jay Oliva (Batman: The Dark Knight Returns) and Ethan Spaulding (Son of Batman) have cranked out a mischievous tongue-in-cheek feature that's entirely aware of the B-list and C-list reputation of their merry band, allowing them to push the boundaries of "adult" vulgarity and self-reference in the space of the games' independent canon. While some of the violence and sexuality skews more towards the needlessly juvenile than maturity, namely in Harley's ... uh, infatuation with Deadshot (a carry-over from DC's recent books), its constant references to the external Batman universe are welcomingly lighthearted: visual triggers from Returns, verbal puns from Batman & Robin, and even a familiar Nolan-verse clown mask make appearances. Some predictable stabs at being "edgy" and on-the-nose Easter eggs stick out like sore thumbs, sure, but they're threaded into the narrative well-enough to dig them in context of what's going on, too. As an action-driven story in the annals of the Batman mythology, this Assault on Arkham doesn't really accomplish much beyond being an overstated, amusing diversion, unsteadily juggling that "root for the bad guy" flip in perspective with seemingly-obligatory screen time with Bats and his bigger nemeses, including an excellent Troy Baker as the Clown Prince himself. The breakneck twists and turns involving the squad alternate between dubiousness and predictability (there's a big "gotcha!" that can be seen a good distance out), but the animation style's brisk action sequences and self-aware humor, surrounded by visual inspiration from the Arkham series of games, frequently offsets the shallow plotting. Despite some missteps, there's a fuse of enjoyment lit in how Warner Bros. worms "Task Force X" into the fray of the familiar setting -- along with Batman's well-restricted presence as their menacing foil, a smaller role for Kevin Conroy's iconic voice -- with no promises in who'll be escaping Arkham as the clashing personalities gleefully tear the place apart. Whether a Suicide Squad movie needs more than that is up for debate, since it doesn't reach the heights of Under the Red Hood or other "mature" glimpses at the Caped Crusader's progeny, but it ends up being a madcap explosion of fun regardless.